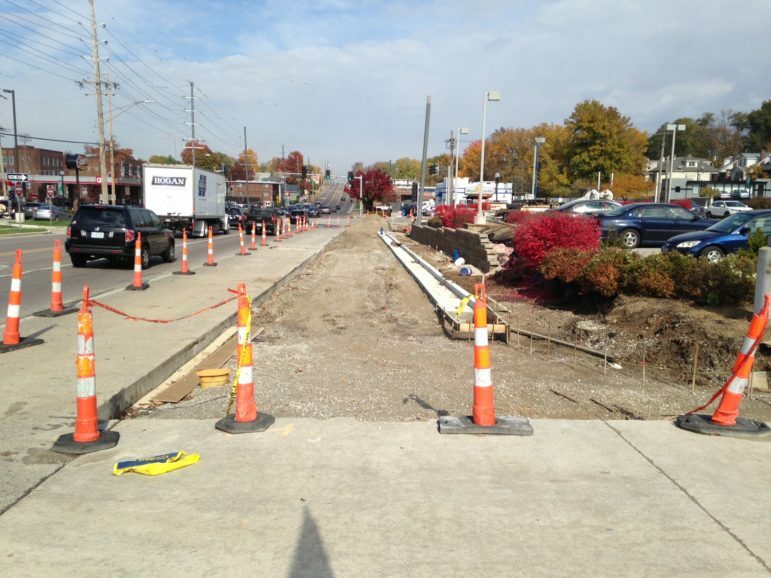 Fiber optic and gas utilities still need to be moved before the sidewalk and road can be finished at S. Big Bend and Manchester, a representative of County Councilman Pat Dolan said Friday. Administrative assistant, Patrick Mulcahy said in an email that utilities (ATT fiber optic duct banks, and Spire) need to relocate the lines before the contractor can finish the road work. “When our office spoke with the Transportation Department last week Spire was still in the process of relocating gas mains on one corner,” Mulcahy said. He said he was including John Shrewsbury, South Area Engineer for St. Louis County Transportation, on the email, who will be able to give a more accurate schedule for complete project completion. Road work is halted on S. Big Bend Boulevard at Manchester Road. OMG! This is most jacked-up project I have seen since the widening of I-40/64 a decade ago. How long must we gridlock Hanley/Big Bend/ Shrewsbury/Laclede Station until this inane improvement is finished? How was the 40/64 project jacked up? They finished if before the deadline. Granted it was dumb because they did not actually widen it all the way through & the 170 South to 40 East interchange is an embarrassment of engineering.. So actually, yes, let’s call it jacked up. Not one bit of that project was designed properly. You got that right. It backs up southbound to Page at rush hour as everyone tries to merge left and right from the Clayton exits. Never backed up like that before and like you said no added capacity for this monumental investment. Why a right turn lane that ends around the corner? A waste of money for sure. Dave your not the sharpest knife in the draw. It is a ridiculously slow project and St. Louis County and everyone need better coordination for sure. However, the right turn lane is needed to keep Big Bend traffic flowing. HELLO. Maybe on future projects St. Louis County will know to get all their ducks in a row prior to beginning a project that wasn’t needed or wanted by the municipality where they are working. This shows the total incompetency of the County street department. Why we needed a dedicated right turn lane to more quickly funnel a lane of traffic onto a two lane, slow moving city street is beyond me. It will take 10+ years before the convenience realized makes up for the months of inconvenience already experienced. Spire can’t finish a simple job, and why is Spire mailing residents letters requiring authorization to allow inspectors in their homes or threaten shutting off their service and administering a fee for reconnection? Laclede Gas never did this and I am unaware of any legislation passed requiring these additional regulations that are a burden on working folks. The inspection is to check the gas service line for corrosion (ie: rust). It is a safety inspection that is required by the MO Public Service Commision every two years on homes that have the gas meters inside. On another point, Spire IS Laclede Gas (it was a name change, not a different company taking over). When the implant was known as Laclede Gas, they did the exact same inspection. Laclede Gas did, in fact, do this….